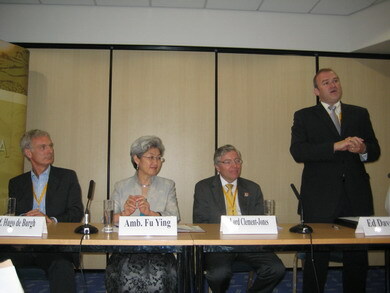 On 23 September, Ambassador Fu Ying chaired the China Forum on the sidelines of the annual meeting of the Liberal Democrats and invited the attendance of special guests such as Shadow Foreign Secretary of the Liberal Democrats Ed Davey, Leader of the House of Lords Lord McNally, Culture, Media and Sport Spokesperson of the House of Lords Lord Clement Jones and Professor Hugo de Bourgh from the China Media Centre of the University of Westminster. The forum was intended to provide an opportunity of dialogue with grassroots members of the Party and send out messages about China. Response was very active among Party members, who stood in a long queue early in the morning and took away all the brochures prepared by the Chinese Embassy. Eventually, over 120 attendants were packed in a room for 70. Many had to stand behind. Some even sat on the floor. Discussions were heard even before the forum official started. There was a keen interest in and deep appreciation of China’s new measures on climate change that President Hu Jinstao had recently announced at the UN conference on climate change. Attendants believed that this showed China’s positive approach and leadership on the issue of climate change. On behalf of the Liberal Democrats, Davey extended warm welcome to the presence of Ambassador Fu Ying and applauded her efforts to host the Forum. He said, it is a great pleasure to attend and address the forum on this special day of historic importance for the relationship between China and the Liberal Democrats. The Party welcomes the positive role that China has played on a wide range of global issues. President Hu Jintao’s remarks on climate change at the UN General Assembly has fully testified to the great contribution that China has made to the Copenhagen Summit on Climate Change. On his visit to China last year, he said that he found his previous knowledge quite preliminary when he saw China’s fast growth and diversified society for himself. He hoped that he can have more chances to access more information about China. He said that many members of Liberal Democrats were concerned about issues such as Tibet, human rights and news freedom and follow with great interest China’s positions on Africa, Sudan and Zimbabwe. But they are ready to have candid dialogues with China to increase mutual understanding and agreements. Professor Hugo de Bourgh talked about his first China visit in early 1970’s. He noted a sense of depression among the people during that period of cultural revolution. Today China is a different country imbued with opportunities and dynamism. He sees China as a country that is interested in exchange, learning and innovation. China, in his view, is not a closed and ideology-dominated society as some Westerners claimed. Rather, the Chinese love reading and have the most active text message writers, bloggers and on-line commentators. People in China are eager to know the world. Chinese students are studying across the world. China is a country full of hope and will play a bigger role in the world. Lord McNally said that China had achieved great progress in its worldwide relations. China and the UK are now capable of friendly and candid dialogues on issues of mutual interest. Bilateral relationship has reached an unprecedented level. It is important for the UK and other EU countries to keep up dialogues with China on all issues and at various levels, and get over internal differences on relationship with China. 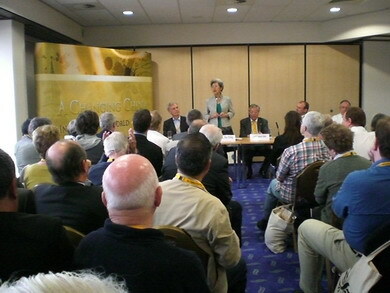 Attendants from the Liberal Democrats were actively raising questions. Some spoke of their favourable impressions about China and its people, their interest in China’s diplomatic policy, its development achievements and responses to climate change. They all shared the commitments to increase understanding and expand consensus with China through dialogue. Concerned were raised on human rights, news freedom and death penalty. And questions of forced relocation, freedom of speech and religious faith, organ transplant and illegal migration also came up during discussion. Fu Ying reflected on China’s historic transformation over the past 60 years. She said, 60 years ago, Chairman Mao Zedong solemnly declared on Tiananmen Rostrum that the Chinese people have stood on their feet. Today, China is not only standing on its feet, but has become a close member of the world community. People in China are celebrating the 60th birthday of their motherland with great joy. They are all happy for the success that China has achieved. Far away from hunger, they are celebrating their own happy lives. What is also worth celebrating is that China has chosen a development path in line with its own national conditions and scored great progress on the diplomatic front. Many are questioning what sort of powers will China be and what message will it send to the world. Indeed, China is making constructive efforts in its response to issues of financial crisis and climate change. The solemn commitment on climate change that President Hu Jintao made at the UN General Assembly yesterday is another proof of China being a responsible power. Fu Ying said, China is still in its reform process and encounters tough challenges in different areas. Reform and opening-up will continue. 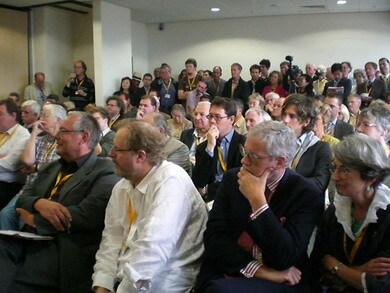 The Liberal Democrats is a major force on Britain’s political arena. The Forum today is designed to have direct dialogue with grassroots members of the Party, let them know more about China and resolve any puzzles that they may have. While briefing the audience on tremendous progress China has made in the promotion and protection of human rights, development of socialist democracy and freedom of speech, Fu Ying gave a whole list of figures and examples. It is evident to all that China has made great headways in its human rights record, which now reaches a level unseen in history. Nevertheless, mistakes were made and improvements are still necessary. As the Chinese people are good at drawing lessons, China will make further progress in its human rights and democracy development. 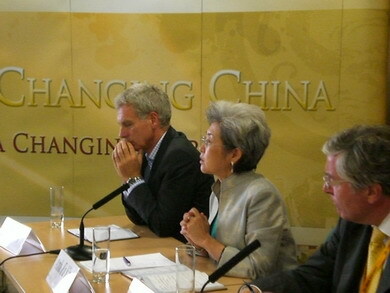 Fu Ying went on to give an overview of democracy-building in China. She said, the Party and the Government are both committed to governing by law in a scientific and democratic way. Policies are developed after thorough studies and full consultations within and outside the Party. Fu Ying said that in China, the citizens’ right of freedom of speech is protected by law. China has the biggest numbers of internet users and bloggers in the world. A survey of on-line news and comments on xinhua.net in a week in May indicates that 20% of the contents involves criticism and oversight of the government. This shows that the Chinese citizens are fully entitled to freedom of speech through news media. Fu also corrected the misconception of one Party member on relocation cases during the Olympics. She said, some unproven claims tend to be rumoured across the West and naturally cause misunderstanding. China should in the future release more information earlier to enable better understanding from the West. At the end of her speech, Fu Ying concluded, today’s exchange has helped us increase mutual understanding. Your questions and comments indicate that you are confident of China’s development and positive of cooperating with China. However, they also show lack of understanding. Fu Ying said, since you have raised quite a few questions, I would just like to leave one to you. Have you ever thought about how the people in China view the West and the UK in particular? Fu Ying said during the summer vacation, she went back home and travelled on a local mountain. She talked to the director of local weather station. He said seriously, all the West wants is to contain China; let there be no fantasy about that. Other friends share the same view. At least quite some people in China think so. Young people are letting out their frustration against the West over internet. They say the West is neither friendly nor accommodating. Fu Ying said, it is important for the West to understand the background and causes of issues in China, rather than judging the country based on their own system and value. Otherwise, the Chinese people will feel lectured. The West needs to think about its own image and has the responsibility to work for better understanding with China. The Forum proceeded in a candid and friendly atmosphere. Attendants all felt highly rewarded. Ambassador Fu Ying’s openness, confidence and modesty demonstrated the competence of Chinese diplomats and left the attendants with a deep impression. They expressed their hope to hear more voices from China in the future.